My wife’s birthday falls far too close to Christmas. I’ve put in numerous requests for it to be moved, but every year it ends up being too bloody close. I’d love for there to be a bit more time between the two, but no, I have to deal with it. So, this time we had a few days planned in London to celebrate and I wanted to get to Bermondsey and visit The Kernel, Brew By Numbers and Anspach & Hobday, and she’d have to just deal with it. I’ve wanted to go to Saturday at The Kernel for a few years now, and I was fully primed to take the opportunity whilst we were in London. Initially, I hadn’t realised just how close The Kernel was to a few other breweries. This had now worked to my advantage and my day was planned around visiting the three breweries all within spitting distance of each other. The wife and I went our separate ways at Victoria and I made my way on the tube to Bermondsey. Now I’ve always promised that I would never do the whole ‘this beer tasted like this’ and ‘the smell reminded me of blah blah blah’, but, as you read on, you’ll realise that you cannot come to Bermondsey, drink it’s beer and contemplate writing about it without doing the whole…..
First up was the Kernel, handily only a few minutes walk from the tube. I opened up my day with the single hop Mosaic pale. Straight from the brewery, you cannot get any fresher than this. And this freshness is what my whole day was about. Like my experience of Punk IPA on draft, except this is brewery fresh beer. This is something I’ve never had the honour of sampling to this extent before and a visit here will open your eyes, and mouth. This is not just a swift two thirds with your mates, this is an experience, as you are about to find out. Back to the Mosaic, visually a light, and slightly cloudy straw colour with a faint green hue. Fresh tropical fruit smell and a really clean but slightly dulled citrus taste. After taste similar to refreshers sweets and it leaves your tongue buzzing, and craving another sip,well mouthfull! This I could drink all day long. Mosaic is definitely one of my favourite hops, along with Fuggle, but that’s just a name thing. Although Mosaic is a fairly new hop, I can see this becoming a classic very quickly. This was followed by the New Zealand Cascade pale. This is a lot more bitter than the mosaic and has quite a tang to it. It’s palette scrubbing and very refreshing. You receive a light tickle on the roof of your mouth from the carbonation, but this softens out with the more you drink and it keeps the taste buds alive. My first Saturday at The Kernel did not disappoint. Brew By Numbers were my second brewery of the day. And what can I say, the staff here are awesome, not that the Kernel’s weren’t, so friendly and welcoming. It was like being on a beer date; I was introduced to their beer, and then I lost my BBN virginity. And it was their Session IPA, Citra that took it. This had pretty much run out on arrival but I got the end of the keg as a taster. Oh my word. The aroma this beer gives off is amazing, I could stand here all day and just sniff this; if this beer was glue, then I’d get what all the fuss was about. Fresh citrus, pineapple and some further tropical fruitiness bunged in; it’s just sublime. Tasting is like a breathe of fresh beer air. It’s clean, smooth and immensely satisfying with a slightly bitter end. Why on earth would you drink lager when you can have this? At 3.9% it’s lighter than your average lager but not even the best lager can compete! I say best lager on the loosest possible terms. Are there really any good lagers out there? Or have I just not found them yet? The traditional porter is so earthy, has the aroma of black coffee and a hint of light soy sauce. The coffee gets deeper on initial tasting then tails off into a gorgeous bitter chocolate finish. Love it. The black IPA with Yakima valley hops, this beer is sublime. Coffee in colour with a fine light brown head. Visually like a porter, but it’s in disguise; It’s much fresher, brighter in the mouth and less viscous. Quite a fruity finish and so refreshing at the same time.I will always hark back to the first time I tried Yakima hops at the Meantime Brewery in their Yakima Red and I’ve been hooked ever since. And I can’t forget to mention the scotch eggs that are available. 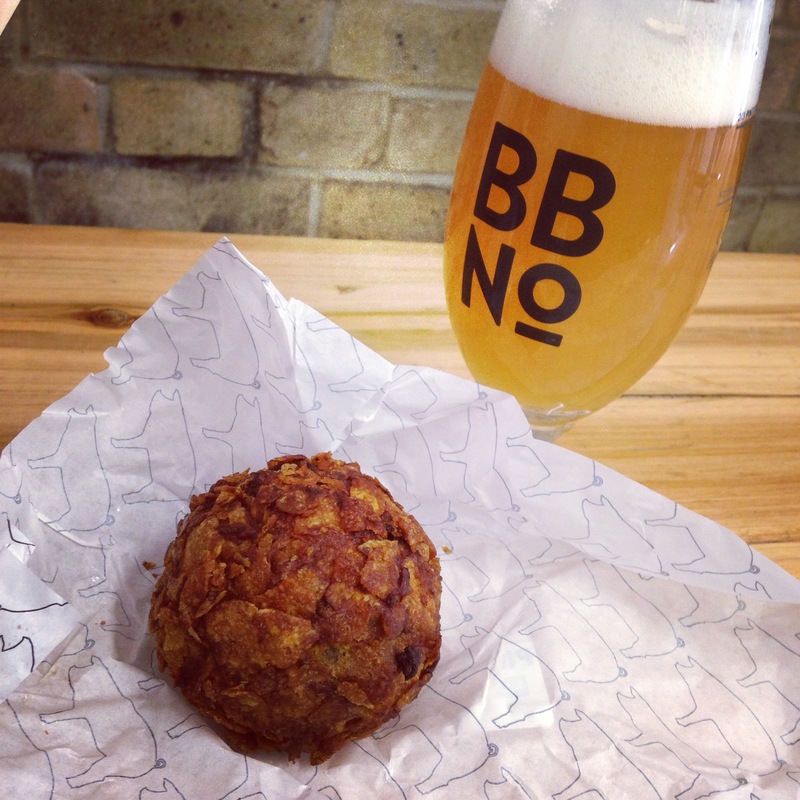 Scotch egg and a beer? Perfect. Also, you pay a £3 deposit for your glass. This means you can return the glass for your tube fare or take it home and add it to your collection! Final brewery of the day was Anspach and Hobday. And their triple hop pale was the beer of choice. Served colder than at BBN, The aroma is outstanding, more complex and fruity. This makes it a lot more punchy on the nose. In the mouth there’s a nice fruity bitterness with a fresh cut grassy edge. Colder is much more refreshing. Same Citra hop as BBN, but with Mosaic and Simcoe added, and brewed to a slightly higher abv. This definitely has more grunt to it. Maybe it’s the temperature or the additional hops, but with the greater bitterness this is much more satisfying. Another fantastic all day beer with an after taste that lingers for a long time, all the way back to Victoria from Bermondsey in fact, and beyond. 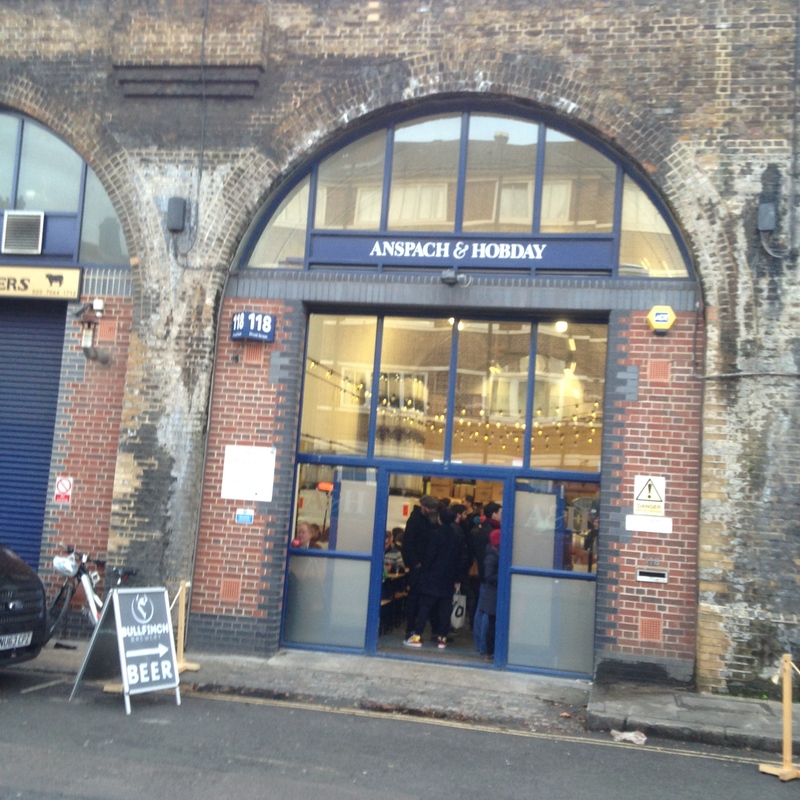 My visit to the three breweries was fantastic, if you are ever in London and you need to lose the wife for a few hours, (don’t let her read this) then you must head over to Bermondsey, on any Saturday, and sample some proper brewery fresh beer. Don’t forget to also bring a bag that’s actually capable of carrying as many bottles as you can possibly fit in it. The bottle choice offered by all the breweries is quite spectacular, and can offer a slightly different range of beers to those available on tap.